Sometimes I change my mind at the last minute as to what to cook for dinner. And so, I take the kids to our local Harris Farm after school to pick up, be it bean sprouts, or our favourite cheese for supper, fresh rice noodles for dinner or fruit and veg for their morning tea crunch box. In exchange for their attendance, I offer them a little treat that they can enjoy for afternoon tea. Seasonal fruit is always a hit – mangoes, berries, bananas, melons and kiwi amongst the favourites, as is cheese, yoghurt and sour cherry loaf. A few weeks ago we popped in around the corner to get something I’d missed before, when the little girl found what she described as “the prettiest food ever”: edible flowers. Pansies (or Violas) to be exact. They are in full bloom at the moment and if you have some growing in your garden, they should be pretty safe to eat according to Mike from Backyard Farming. We picked a box for the girl, and some sour cherry loaf for the boy, and began to brainstorm dessert ideas for the evening that would incorporate our pretty and slightly unusual new food find. We thought of cupcakes, and brownies, and even some ice cream, but most of these were a little too time consuming for us to make and the flowers would probably not fare too well in the process. Considering they do not impart much flavour, we were more after aesthetics. Then I remembered. I had a box of store-bought mini meringues that we could layer with unsweetened natural Lush yoghurt and ripe Queensland strawberries that are in peak season right now. Eton Mess! All decorated with fresh pansies, of course! If you are allergic to dairy feel free to use coconut or soy yoghurt, or try this coconut custard instead. 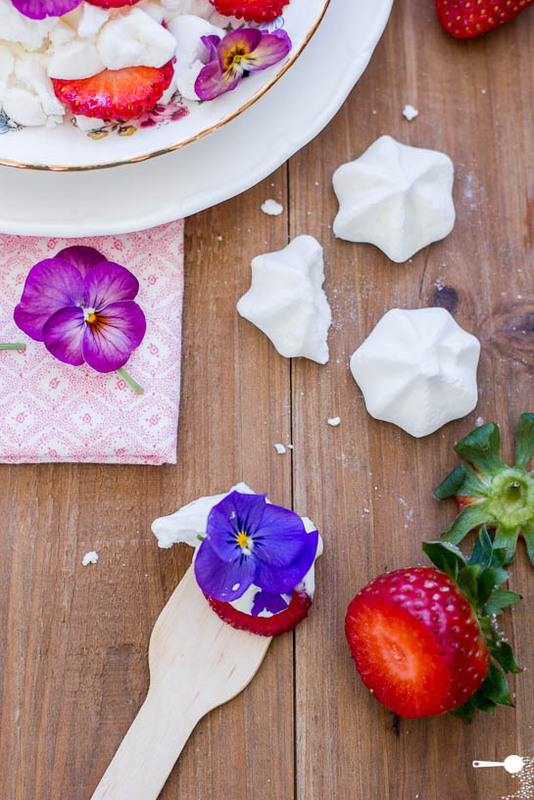 So, tell me, have you cooked with fresh edible flowers before? What did you make? Roses: great for decorating cakes, steeping in tea or making this beautiful rose petal jam (very popular in Poland and often used as jam donut filling). Carnations: can be steeped in wine, sugar, or used as cake decoration. They are said to be one of the secret ingredients that has been used to make Chartreuse, a very potent French liqueur. Nasturtiums: add leaves and stems to any green salad for a peppery lift. Flowers can be stuffed with cream cheese, or added to salads. Pickled nasturtium seeds make a cheap caper substitute. Hibiscus: use petals in salads or as garnish. The flower can be dried to make an exotic tea, or preserved in syrup and added to champagne or sparkling wine. Marigolds: a budget-friendly substitute for saffron. Can be added to salads as they have a light citrus flavour. Strawberries are the most traditional choice of fruit in Eton Mess, but passionfruit, kiwi or bananas would work just as well. If you are allergic to dairy feel free to use coconut or soy yoghurt, or try this coconut custard instead. On a plate or in a glass, layer crushed meringue, yoghurt, sliced strawberries. Decorate with pansies (violas) and serve. What a beautiful dessert or afternoon tea idea! Great to hear you treat your children to interesting foods that help them learn about the more unusual. I’ve only ever cooked with zucchini flowers. Zucchini flowers are some of my favourites actually. Do you normally stuff them? Oh my! Such a quick and easy dessert. 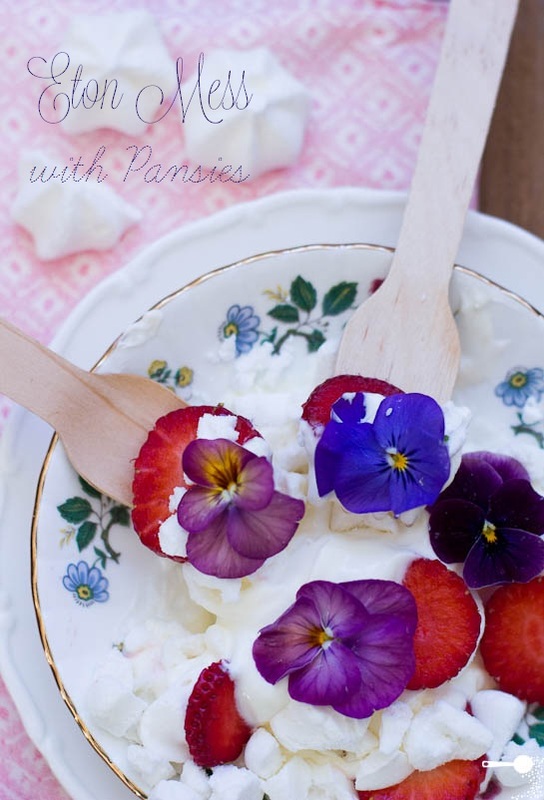 Love the yogurt, strawberries are perfect at the moment… Bliss! I’ve never heard of coconut yogurt? Could I use coconut cream instead for a dairy-free version? I’ve seen coconut yoghurt at a few organic markets in Sydney. You could use coconut cream (go for organic as it contains over 99% coconut flesh extract it’s super thick and creamy), but it may not have the same acidity as yoghurt would. You could squeeze a little lime on though! Oh Martyna: how absolutely pretty! I’m glad your daughter is learning to use flowers at such a tender age! 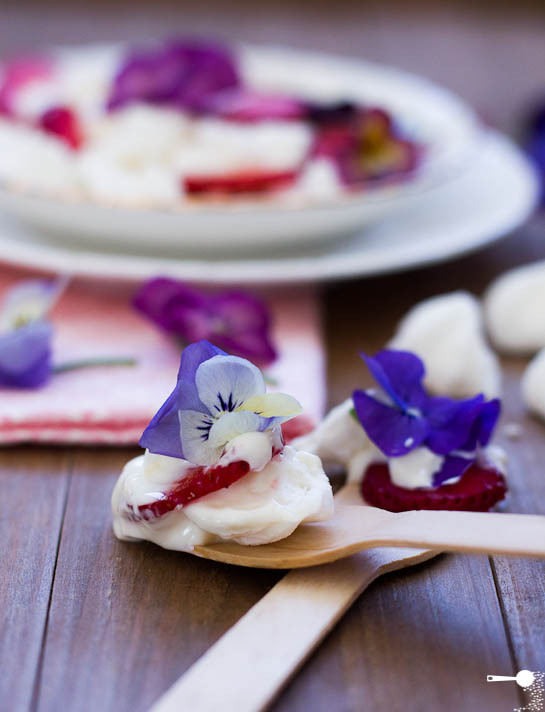 OK, Eton Mess has been around forever – the ‘ruddy’ name draws people to find out what it is, BUT this is such a lovely, simple, healthy version!! I was afraid to use flowers initially: nasturtiums came first, then roses – now am beginning with the pansy family, but still ‘afraid’ of marigolds 🙁 ! Thanks for teaching . . . 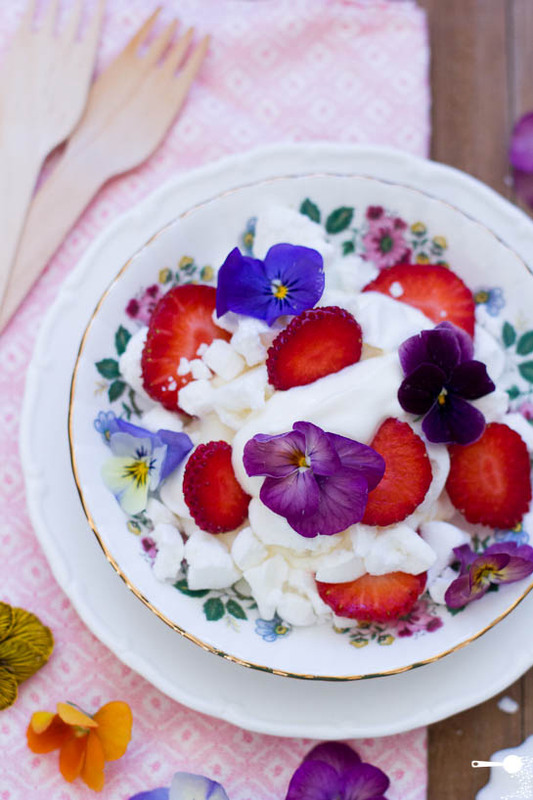 This Eton Mess looks everything BUT a mess! I love the introduction of edible flowers and have to admit I don’t use flowers as often as I would like. Thanks Amanda and Raymund. Let’s settle on “arranged” mess. Thanks Maureen, it’s amazing what you can create with a few simple ingredients. 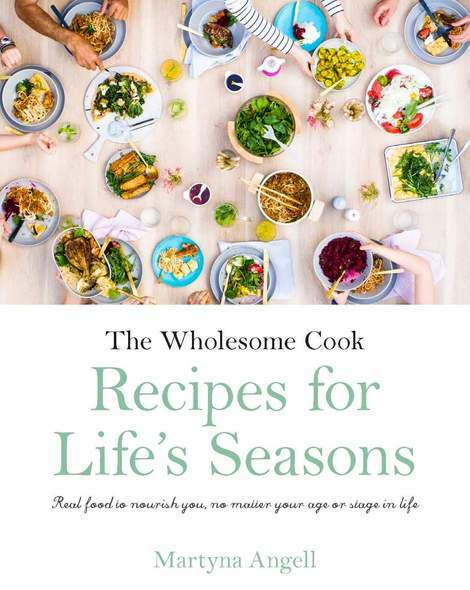 And if you’re ever in Sydney in spring you’re welcome to pop by and I will make one for you. Whoa… PRETTY!!! I’ve had edible flowers on my food at restaurants but never decorated like this at home… my daughter will sequel for joy! Very pretty and fancy dessert! 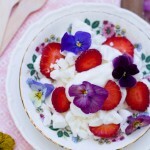 I love Eton mess but I’ve never seen it decorated quite like this! How beautiful! Marty, I love eton mess…. and edible flowers make the whole thing so much prettier! Great to meet you by the way!